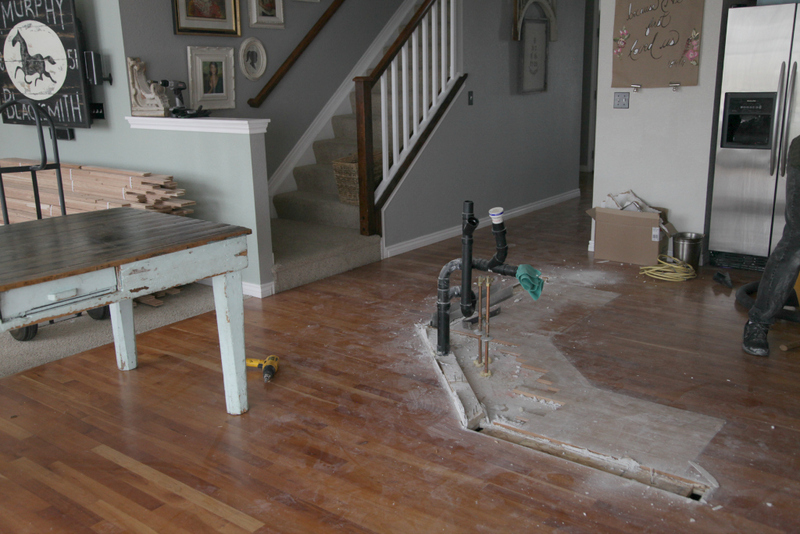 When we made the decision to rip out our existing island we had planned on paying a contractor to do the work. What did we know and how could we take on a project this big? 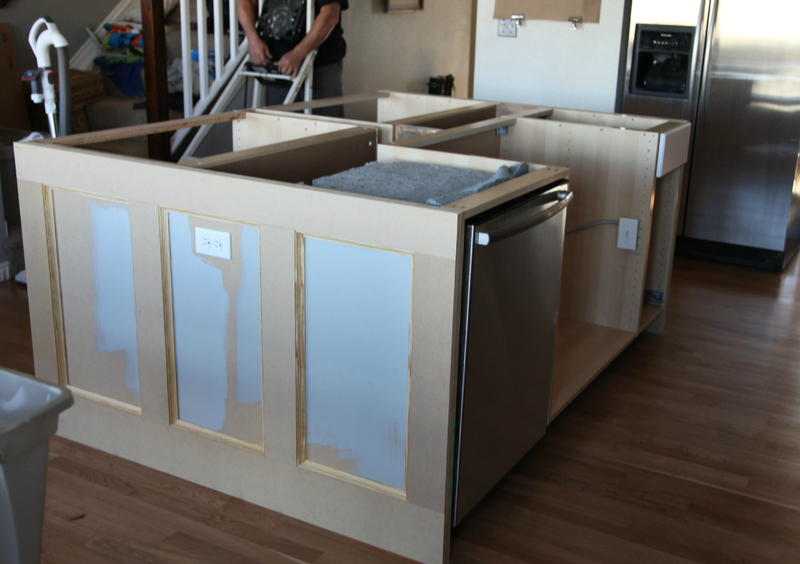 We knew we didn’t want what we had but where would we even begin to pick out the insides of the cabinets and basic design? As we were walking through IKEA one night we both stopped in our tracks and were really looking at some of their island designs. 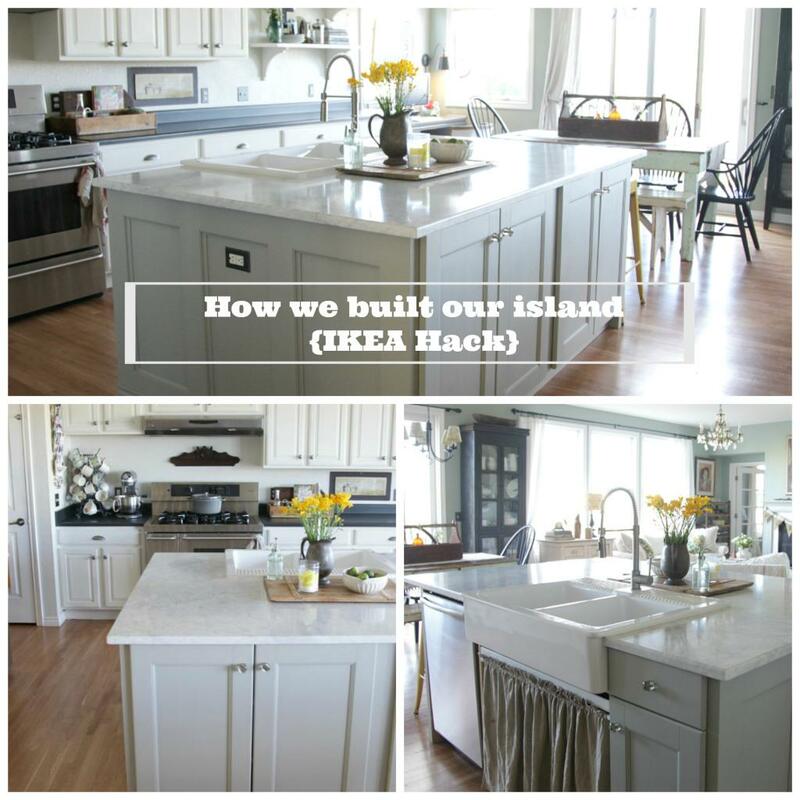 We didn’t want what IKEA was selling for our island but it allowed us to think outside the box and to realize we could piece together the cabinets that would make our ideal island. With a little puzzle work, a brother that did electrical and plumping, a husband that dabbles in woodworking and a wife that would do the painting…we were on our way. All resources are listed at the end. If you have any questions please feel free to ask in the comment section. We purchased different size cabinets that would allow us to have two large cabinets on one side, cabinets under the sink, sink mount (we bought our sink also at IKEA) and a smaller drawer and cabinet to the right of the sink. 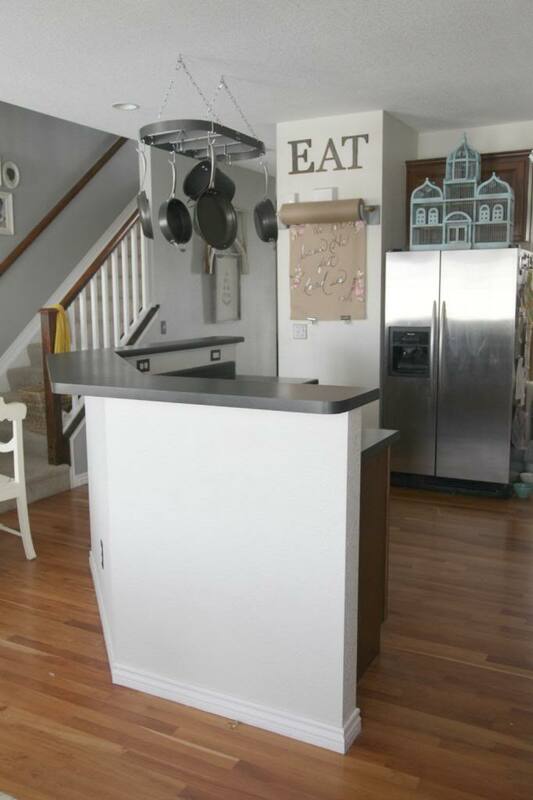 We knew we wanted to have the freedom to paint the cabinets over and over if needed so we chose the white unfinished wood cabinets. 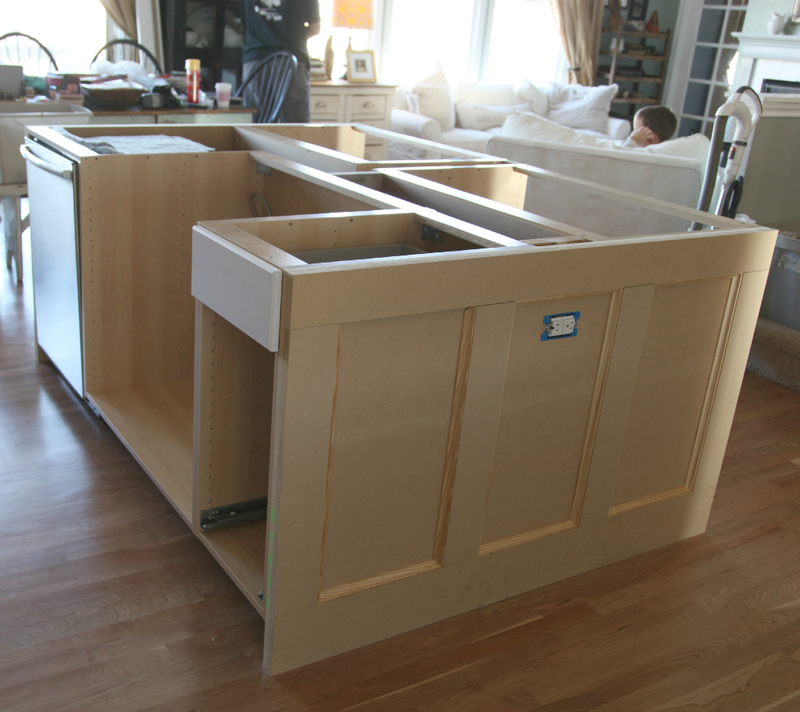 As you can see we have gaps around the cabinets because we needed to space them out to create the island size we really desired. We did the best we could to take advantage of the spaces between the cabinets and to make sure we had charging stations and all the outlets we could need. 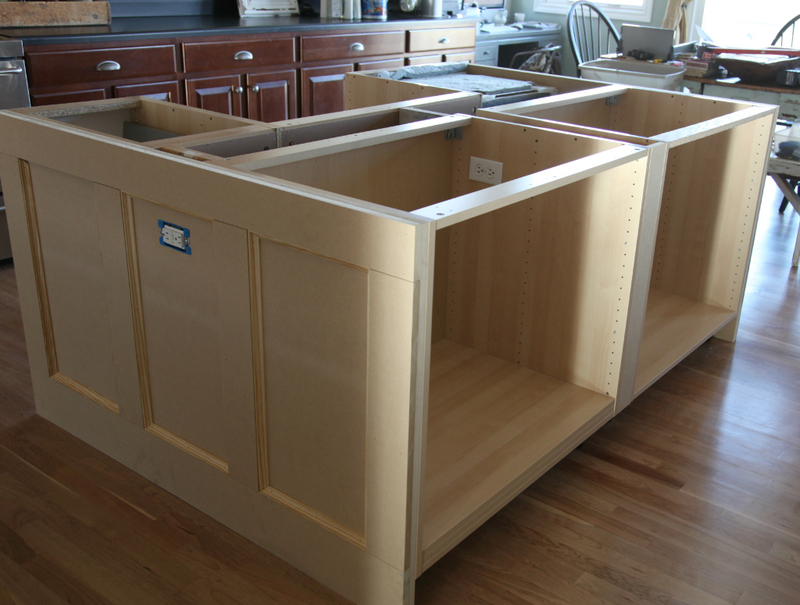 On each side of the cabinets we attached 3/4″ MDF to build our custom wainscoting and pull the cabinet space together. 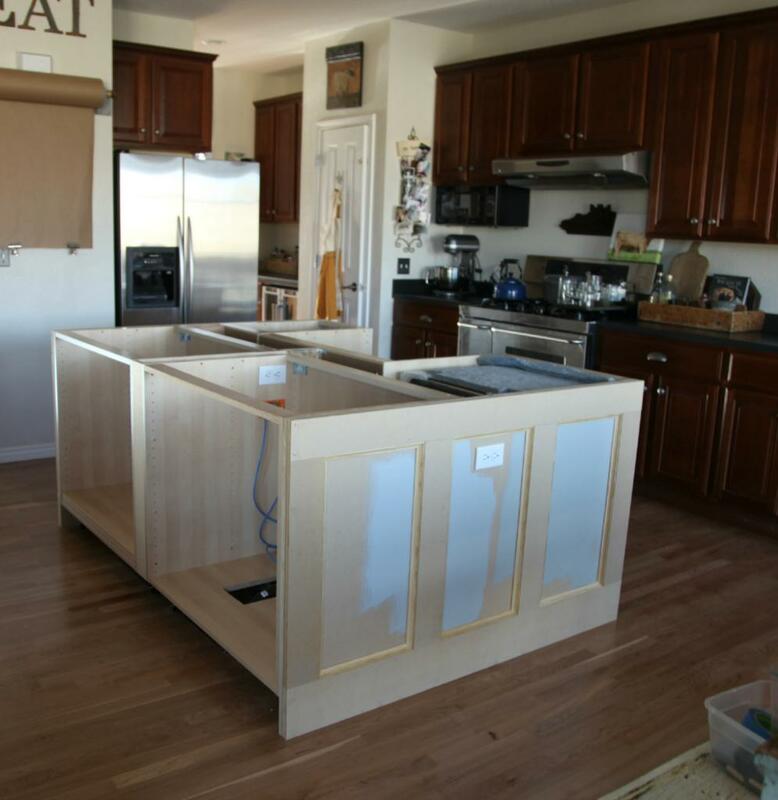 This was very important to me to include the custom woodwork and create an island that looked more like a furniture piece and to also incorporate the design elements that are throughout the house. 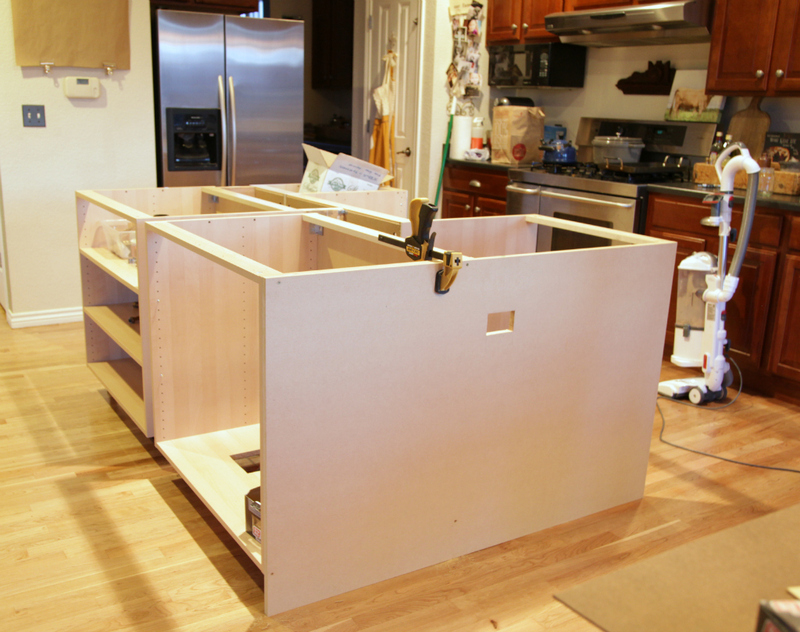 Anywhere we had gaps between the cabinet we included MDF to close the space. 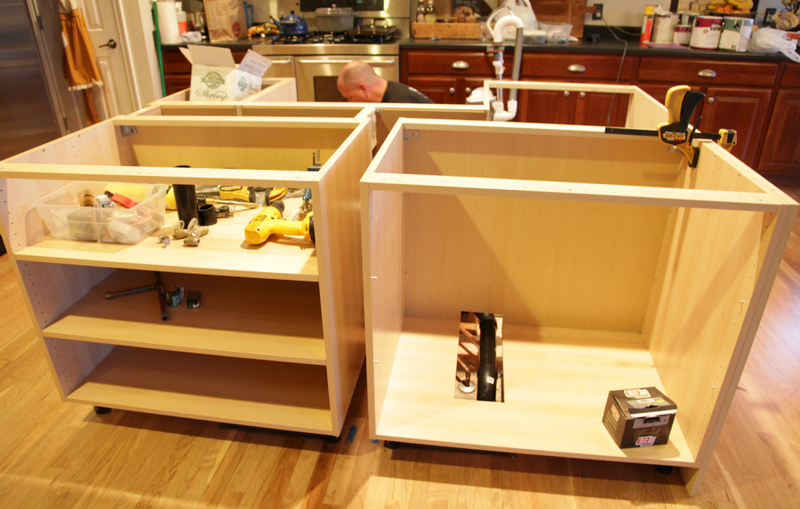 Kelly was able to use the larger gap between the two larger cabinets to hide our Wi-Fi access point. The wood panel is removable using speaker grill fastners. Pretty clever! These cabinets also were wired for our charging station, printer and microwave. From this angle you can see all the spacing that is still visible from the top but all along the sides it had now been closed in. 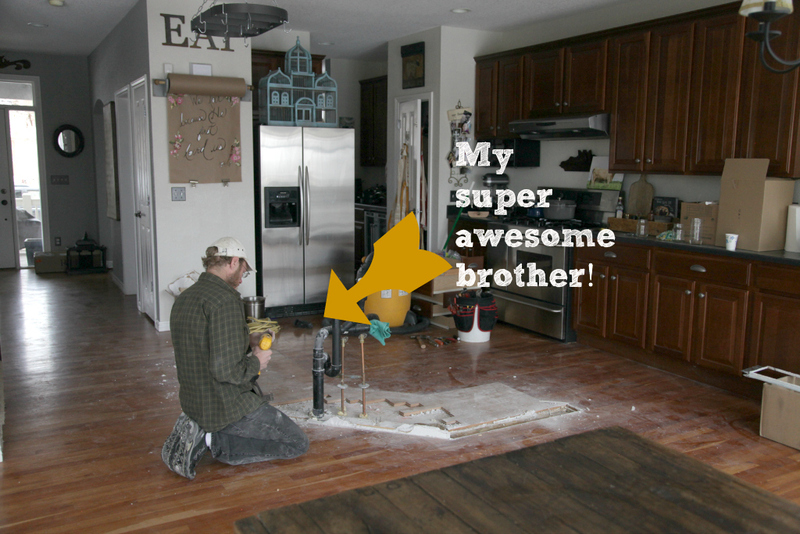 Kelly and my brother were able to do all of the electrical and plumbing which saved us on money and time because we were often working on the island late at night. We installed the garbage disposal switch under the sink because we didn’t want to have a hole cut in the marble counter top. I am still not sure I like it there but I can’t say I would love it on the counter either. I almost never paint anything without trying out the samples in the space and really living with the choices for a few days. I think one of the biggest mistakes anyone can make when choosing paint is to not sample them first. 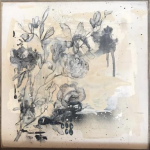 It is worth the time and small amount of money to see what the samples will look like in your space with your lighting. Don’t ever rely on the paint swatches for a realistic paint color. We sampled three colors for the island and we ended up choosing Fieldstone by Benjamin Moore in eggshell. I am still so happy with our choice and the paint has held up beautifully in the space. 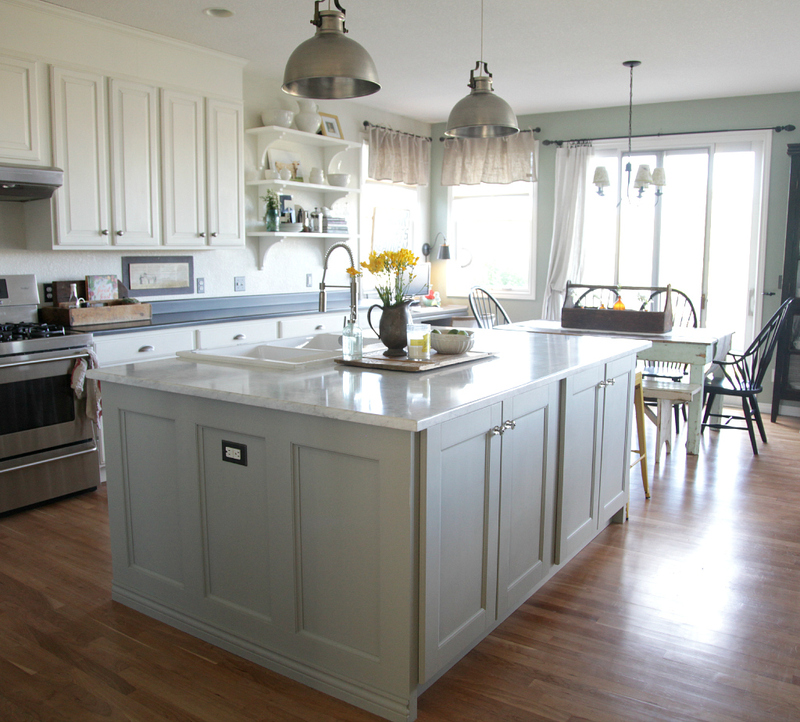 We primed and lightly sanded the cabinets before we painted and we even used paint with primer for a better coverage (Aura by Benjamin Moore). We also primed all of the MDF before we painted. 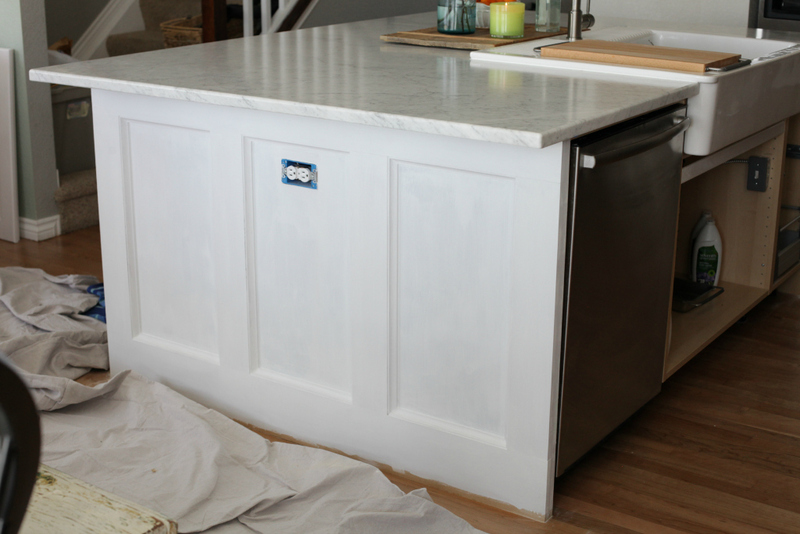 Before our Carrara marble could be installed we needed to have the island completely built and ready to paint. 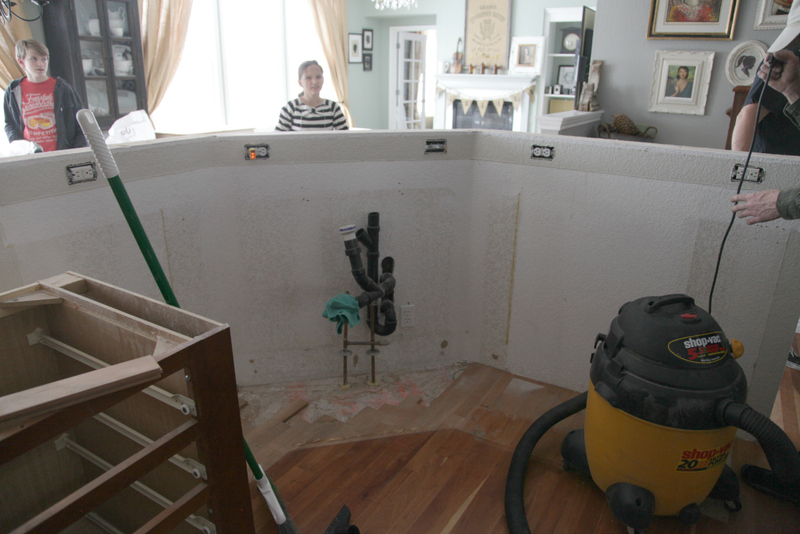 At this point in the renovation we had been without water in our kitchen for a full month. 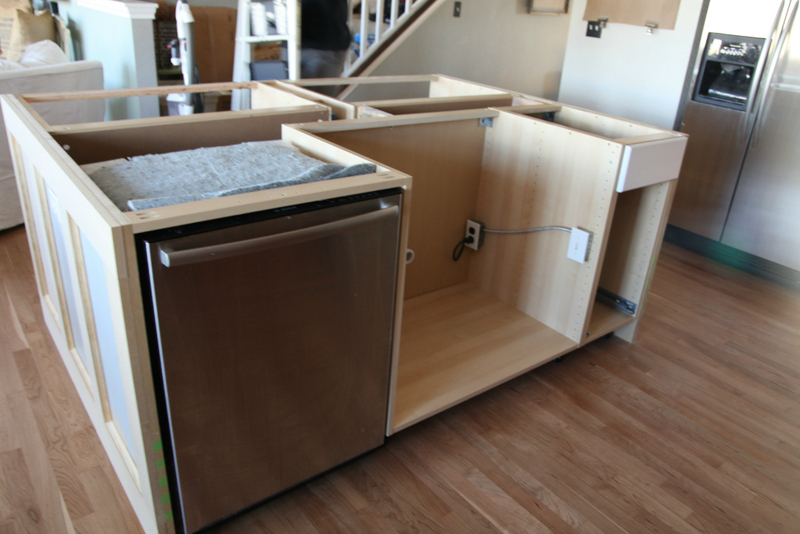 We were really excited to get the counter and sink installed and to get the water back on. 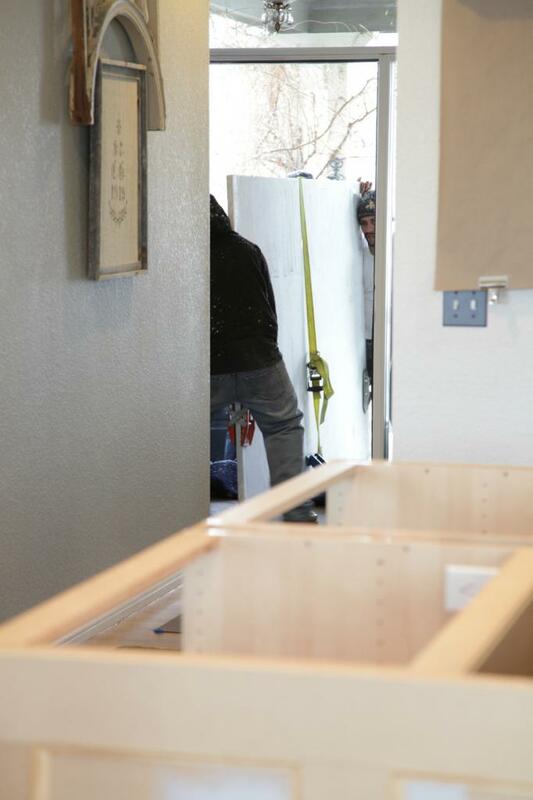 Our marble was dropped and chipped the first time they came but here they are bringing in our counter a few days later and it was the beginning of a six month customer service nightmare that has not ended. I don’t want to make this post about that experience but I do want to make sure my local friends and readers know not to use Stone City to fabricate any of your projects. You can read my Yelp review HERE. I still can’t believe that we really did this! There isn’t a day that goes by that I don’t find the new island so beautiful and functional. It was so much work and it was hard to not have our kitchen for a month but I would do it again in a second to have this result. What a difference! 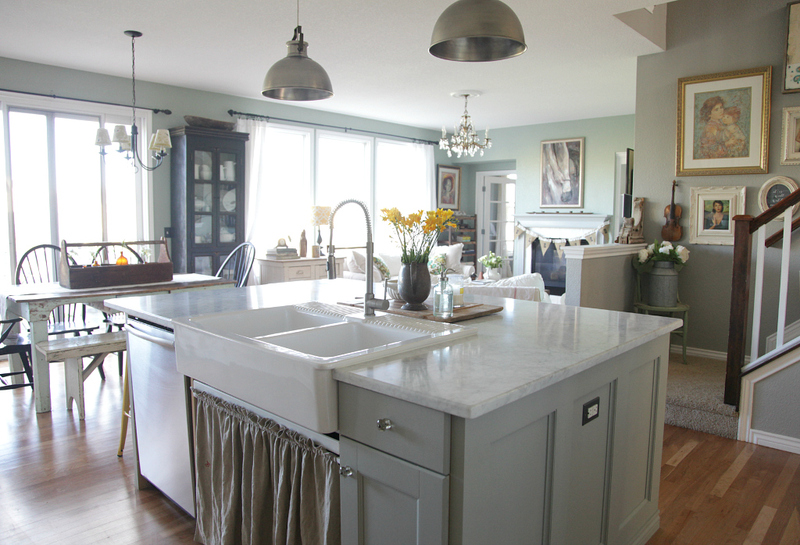 You did such a beautiful job on the design and execution of this island! Wow you did an awesome job!!! This is so amazing and clever, Jeanne. What wonderful husband and brother you have! I have been enjoying seeing you transform your kitchen. Thanks so much for sharing. What a fresh improvement! I love the open space and your colors. Could you show us the yellow stools? I’m starting a renovation on a house we bought and I’m stuck already. There are lots of decisions and planning in making changes like this. Congratulations! So fabulous! Even though our kitchen is in great condition this makes me want to rip it all out and update! Thank you for sharing! Hello! Question for you regarding your island. 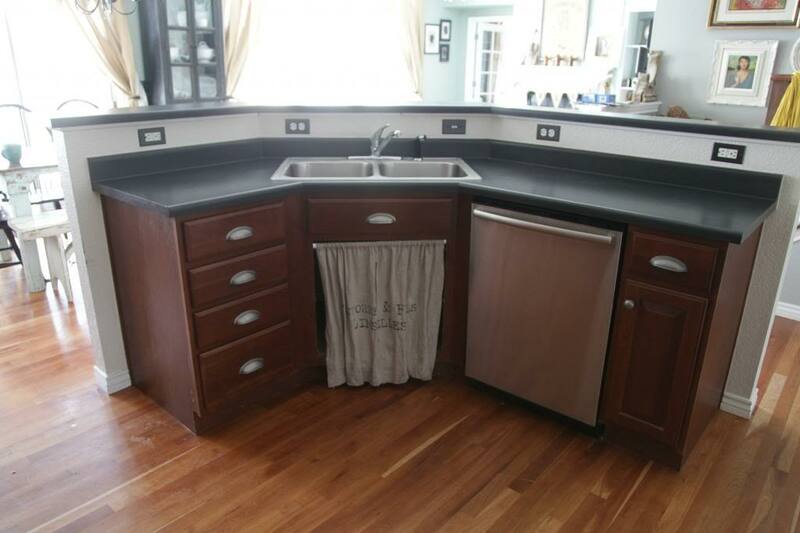 Did you need to put anything below the marble before placing it on the cabinets? The island was all of the support. There was support under the marble for the whole thing. It was not just outside support. Otherwise, nothing else was placed on top of the cabinets before the marble was in place. Thanks. 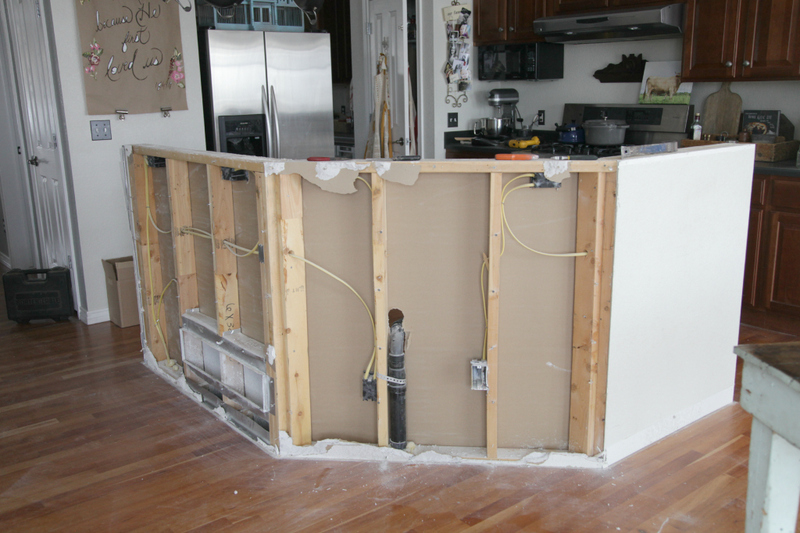 Noting that the sink is meant to go against a wall and not on island I am preparing to do the same as you. Did you just use silicone to seal the back? Wow. You all did an amazing job! 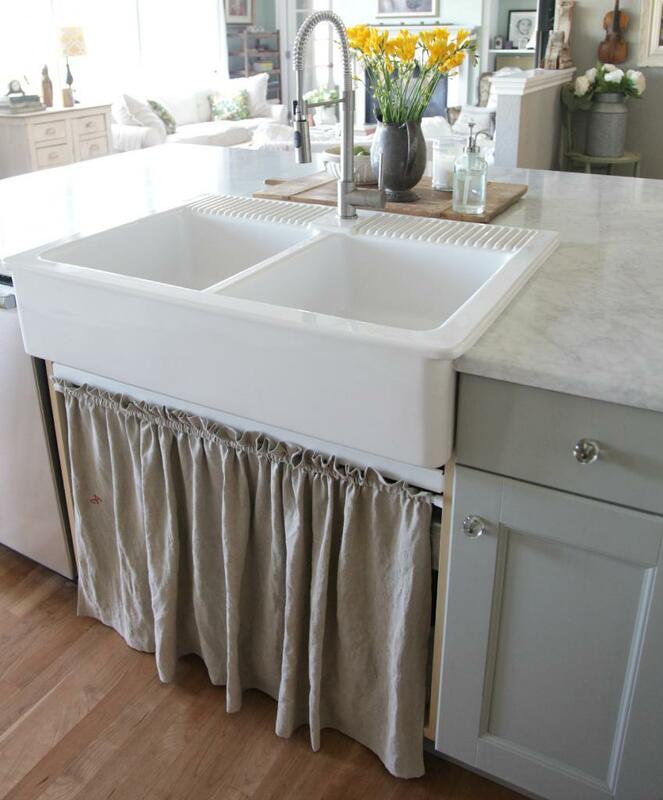 How do you like the IKEA apron sink? I was unable to find many reviews and was wondering about the quality. We no longer live at that home but I LOVED it while we were there. Highly recommend it. I wish you would show us where the Microwave is. We don’t use a microwave much. In fact, I don’t use it at all and my husband is the only one that occasionally does. It is not a big part of our daily life so it was in a cabinet facing the living room. Thanks! Hope that helps. Hi there! 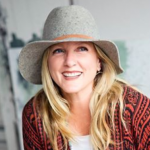 Awesome job…love how you though outside the box! We just bought a larger house for our ever growing family of now 7 and would love to rip of the awkward island that’s in it and build something more to our liking but amongst other improvements this house needs…….we are trying to stay on a budget! I’d love to save where we can and an IKEA just opened 5min down the rd from me!!! score!! I was curious how much this project cost you mins the sink and appliances! Trying to get a feel for if it’s worth paying someone or doing it ourselves! THanks so much. Mallory, I am so glad you liked this project. We used marble so your hard surfaces will change the price a lot. This was enough years ago that the only price I remember is the marble and it was a lot:-) Sorry I don’t remember the budget. Good luck on your own project!